Tanzania hopes that fresh investment will boost its flagging coffee industry. 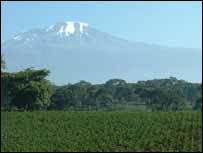 Nestling in the rolling foothills of Africa's tallest mountain, Mount Kilimanjaro, are miles and miles of coffee bushes planted in neat rows. This is the centre of Tanzania's coffee industry and it is not difficult to see why. The rich soil, good humidity, sufficient rainfall and correct temperatures make for perfect cultivation conditions, but despite all that, over the last thirty years the coffee industry in Tanzania has been in terminal decline. Now the industry is hoping to reverse that trend by world by embarking on an ambitious project to replace around 200 million bushes across the country. 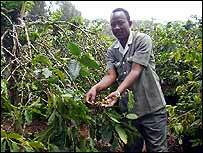 It's hoped that in the next ten years Tanzania may become one of the leading coffee producers in the world. There is a lot of catching up to do. Tanzania produces between 40-50,000 metric tonnes of coffee a year, making it only the sixth largest coffee producer in Africa after Cote d'Ivoire, Cameroon, Uganda, Ethiopia and Kenya. The government wants to double Tanzania's output, but that will happen only after the entire coffee bush stock is replaced. The organisation behind this huge task is the Tanzania Coffee Research Institute (Tacri), an institute which was set up in September 2001 to kick-start the industry. Twahir Nzallawahe, Tacri's head of research, said it is a drastic but necessary move. 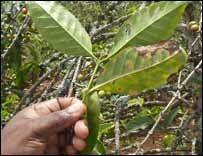 "The coffee bushes which are growing in Tanzania are very susceptible to disease, especially leaf rust and coffee berry disease. "In some cases, farmers have lost up to 90% of their crop as a result of theses diseases, so we are trying to find new varieties of disease resistant coffee bushes. "When we have found the best varieties we will attempt to replant every bush in the country," he told the BBC. The diseases, of course, affect bushes across Africa, but what makes Tanzania's industry so vulnerable is the fact that 90% of coffee production comes from smallholders who cannot afford the costly pesticides and fertilizers which are used on large estates in other coffee producing countries. Augustino Kishumba is one of around 400,000 smallholders in Tanzania. His 20 acre farm is buried deep in the lush vegetation in the shadow of Mount Kilimanjaro. Towering banana trees jostle for space with cassava plants, flowers and a new variety of coffee bush developed by Tacri. The branches of his coffee bushes are laden with the bright red berries from which coffee beans are harvested, showing that this particular variety is flourishing. "These bushes grow well and have a higher yield than the ones I grew before. So far they have not caught any disease, so I am confident that I will be able to make money," Mr Kishumba said. Over the past few years, making money is something that has not been easy for coffee farmers, large and small, wherever they are in the world. Coffee prices have been at historically low levels, driving many smallholders in Tanzania to subsistence farming or to grow other more profitable crops like flowers. The price of coffee is not an issue that worries Tacri's Twahir Nzallawahe. "This is a long-term project as we plan to oversee the replanting of around five million bushes a year. "So hopefully by 2010 when we are hoping to produce 100,000 metric tonnes of coffee a year, the price will have improved," he says. Tanzania also has a trump card in that it is one of only three coffee producing countries in the world which grows Colombian Mild, which is a highly prized Arabica bean; the other two are Kenya and Colombia. "Arabica is a finer coffee bean than the more common Robusta variety and as a result it gets a better price on the world market. So even if we do not produce as much coffee as Cote d'Ivoire or Cameroon, we can still have a highly profitable industry," says Mr Nzallawahe. There is clearly a lot of work to do before that vision becomes a reality. The demand from Tanzania's two biggest export markets, Germany and Japan is strong, but that demand will only be met once Tanzania has replaced its ailing stock of pest-prone coffee bushes. Grounds for a coffee revolution?